Dearest Earl, what a precious albino ferret you are! You are so cute with that fluffy white fur and the pink nose and eyes. You have quite a story to tell.. first found on the highway, then given away by one family after their other ferrets picked on you, and finally finding your delightful perfect family and permanent home! Now you are living the wonderful life you deserve (and deserved all along). You have lots of love and good care and tasty food and places to explore. You like to sleep on people's laps, and you sleep with your dear special friend each night. Once you bit the family's pet chicken, but now you and she are kept apart. You and all your family members love each other very much, don't you. What a wonderful love-filled home you share! 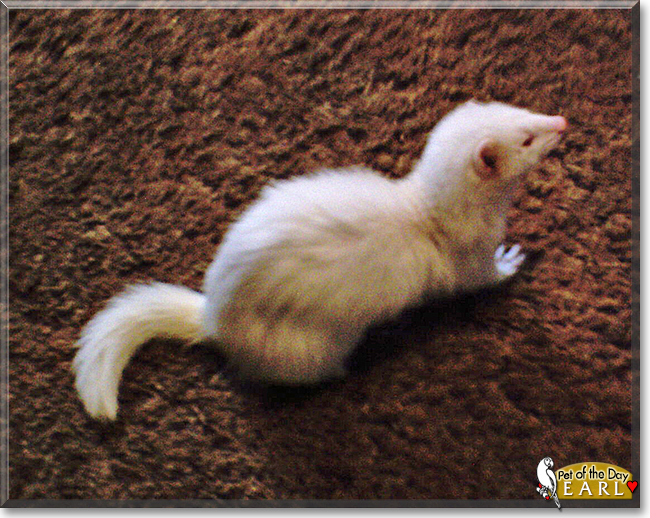 Congratulations, darling Earl, on being chosen today's Pet of the Day! We hope you and your dear people and chicken pal and all your family and friends are enjoying a fine celebration, full of fun and lovies and all your favorite games and treats. Hi Earl! Happy Pet of the Day, sweetheart! What a beautiful, frisky, fun loving girl you are, Earl! And oh, how heartwarming a homecoming story is yours! Found along a roadside, temporarily fostered by your rescuers, your finally found your way to that knowing, loving, committed forever family you so rightly deserved! And oh, didn't you hit the forever home jackpot, truly living the good, able to enjoy walks on your farm come summertime, digging holes in search of moles; munching on Corn Chex, hehe; being loved unconditionally by your devoted humans! What more could a Ferret hope for? And how lucky is your family, having a sweet and loving best furry friend, a card carrying family member in you! You're a gem, Earl, just as special as they come, and so very deserving of your big day of honor! Thanks for the BIG smiles, sweetheart! Meeting you today has been a real treat! I hope you're enjoying a very special day of celebration...munching on Corn Chex, warming your humans' laps and tonight, cuddling in the big bed with your *special human,* being loved and pampered to pieces! Lots of love, snuggles and kisses to you, precious Earl, our very special and most deserving Pet of the Day, EVERY day! So lucky that you were found before something bad happened to you. Now you have a wonderful life full of adventure and fun. Earl is an adorable albino Ferret. Found by the roadside, she now has a forever home. Congratulations on being Pet of the Day, pretty Earl!